If you're looking for an eccentric crossover that will make you stand out in a crowd, come view the new 2017 Nissan Juke in Frisco. Complete with unique curves and headlights, the Juke is easily one of the most distinct models in the crossover segment, which is why buyers continue to flock to it. 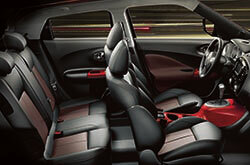 Additionally, it offers outstanding performance and delivers sporty handling regardless of which trim you choose. Take a look at our 2017 Nissan Juke review below to learn more about the model and its offerings. 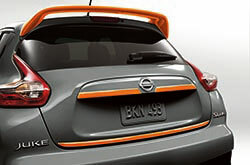 You can purchase the Juke in multiple trims: S, SV, SL, NIMSO and NISMO RS. All five models come with full power accessories, cruise control, a trip computer, Bluetooth, keyless entry/ignition and a CD player. This year, SV models now come standard with a Cold Weather Package that adds on heated front cloth seats and heated outside mirrors. 17-inch machined-finished aluminum-alloy wheels have also been added to this model, as well as the SL trim. The two special models ¬- NISMO and NISMO RS - come with a number of perfromance tweaks. The NISMO gets summer tires, 18-inch alloy wheels, sportier suspension and tuning calibrations, and front sport seats, while the NISMO RS gets larger brakes, aggressive suspension tuning, Recaro front seats and a limited-slip differential. A 1.6L four-cylinder engine, delivering 188 horsepower and 177 lb.-ft. of torque, is fitted on the 2017 Nissan Juke in Frisco. All models aside from the Juke NISMO RS come with the engine, which can be matched with either a CVT or six-speed manual depending on the model. The NISMO RS comes with an upgraded version of the four-cylinder that outputs 215 horsepower and 210 lb.-ft. of torque when equipped on front-wheel drive models. All-wheel drive variants offer 211 horsepower and 184 lb.-ft. of torque. A CVT or six-speed manual is also offered on the NISMO RS model. Noted in many 2017 Nissan Juke reviews, a rearview camera comes standard on all Juke trims. 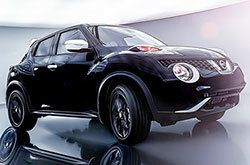 Antilock brakes, traction control, stability control, dual-stage front airbags, side curtain airbags, front-seat side airbags and active front head restraints are also all featured on the latest Juke model in Frisco. Please call 844-871-9472 for further assistance. 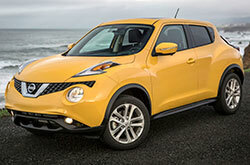 Want More Specifications on the Nissan Juke? If you've been in the market for new cars near Dallas like the 2017 Honda HR-V, Buick Encore, Kia Soul and the Fiat 500X, then you should certainly view the 2017 Nissan Juke. 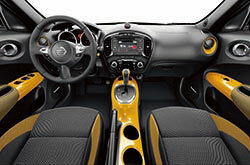 Offering an fun personality and progressive cabin amenities, it could be just what you need from a vehicle. Look over the tools in our review to find out if the 2017 Nissan Juke is a match for you, then browse hot-off-the-press OEM financing offers! 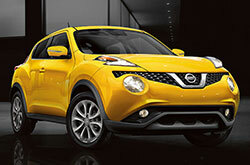 To see a desirable selection of cars, come to us to find lease offers on the inimitable Nissan Juke. Our review is here to help you with making a discerning choice when shopping for a car, and we hope it includes the information you need for this. Get prepped to be amazed with the new Nissan Juke for sale in Frisco, TX. Email to schedule an appointment for a showing. If you can't wait to see it at our dealership, take a peek at its dapper interior in the embedded video clip before you visit. *Get Today's Price is available to all customers and can also be obtained by calling or coming into the dealership today. Purchase prices do not include tax, title, license and $150.00 doc fee. Prices include the listed Nissan offers. Please verify all information. We are not responsible for typographical, technical, or misprint errors. Inventory is subject to prior sale. Contact us via phone or email for more details.